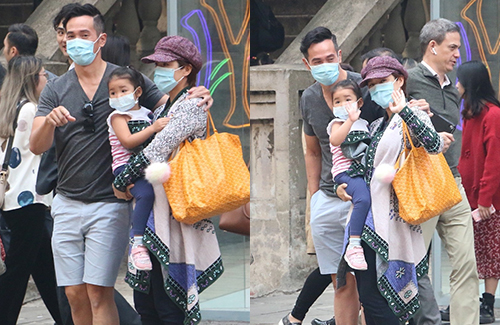 Moses Chan (陳豪) and Aimee Chan’s (陳茵媺) 2-year-old daughter Camilla is a special one. The youngest sister of two older brothers, Camilla is the baby of the family, and the center of attention. Hong Kong’s current winter flu season is among the deadliest in recent years. Many kindergarten schools had to close for the week due to sick students. When Moses and Aimee were spotted out in the streets with Camilla last weekend, the family of three were all seen wearing face masks. It was a relatively chill day in Central, but not nearly cold enough to warrant thick jackets. Moses wore T-shirt and shorts, while Camilla wore a tank top. As they were waiting to cross a red light, Moses spotted paparazzi across the street. He said a few things to Aimee and pointed in the paparazzi’s direction. Aimee looked and smile. She also told Camilla to wave at the reporters in greeting.